from the recently concluded Robert Edwards Auction. Initially I was worried that I may have over-paid, but as I opened the box I became instantly relieved. Just some incredible stuff. I won a large lot of 19th Century Basbeall related items. The photo above comes from a 1885 childrens ABC book by McLoughlin Bros. of New York. 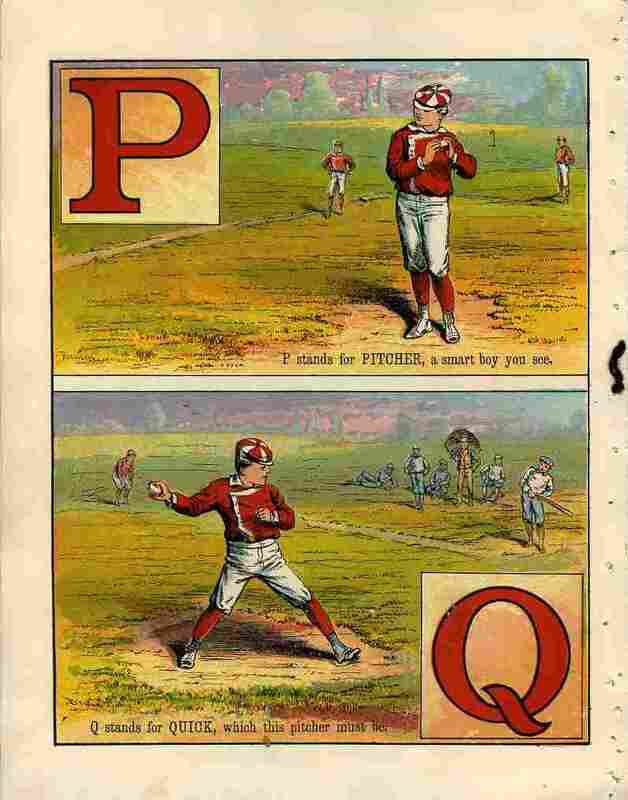 It is complete with all the letters of the alphabet and has some incredibly bright and gorgeous lithograph style pictures. This is much nicer than I expected. A bit beat-up, but a nice find. 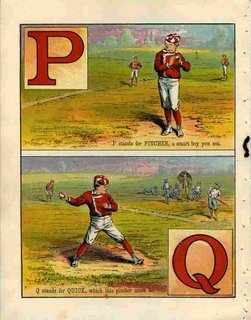 Also, there was a group of 15 scorecards from the time period; including a complete mint condition set of 1880's Wright & Ditson scorecards. There was so much here I will pass on listing them all, but I will periodically highlight various items from this buy over the next coming months. You can see photos of most of the items in my photoalbum. "struck out 10 and gave up four hits and four walks in his second regular-season start for the independent Fort Worth Cats. His fastball was consistently in the low 90-mph range and he showed an above-average curveball." Considering that this years draft class will probably be one of the weakest in the last decade it would make alot of sense to sign him now. I see a very productive future for this pitcher. Let's make sure he wears BLUE. Well.. Of course I know the answer. I don't personally know Rob McMillin, but I feel like I do. I'm a daily lurker on his blog which is often filled with a lot of data and information, great insight and descriptions of behind the scenes machinations. His blog 6-4-2--an Angles/Dodgers Double Play Blog is one of the better Dodger fan sites. At this Sundays game he splurged and rented a Dodger suite. He had the Weisman's of DodgerThoughts, Rich Lederer of Baseball Analyst and Rev of HalosHeaven there along with many other friends. He has pictures that are worth a look.